This is what they look like if you just stamp them in Tangerine Fusion ink. A little flat and kinda boring. When I added the color with the Journey Color Burst Pencils = WOW! If I can do this, you can too! I’m not super artistic but I can add a little bit of shading. Check out the video tutorial where I add some color to the acorns from this card here and then I add color to the pumpkins and make the pumpkin card. The video is a little bit long (sorry) but you really wont believe how easy it is! What do you think? Can you add color to your images? Can you tell I just “wing” it and layer the colors? The image really does POP! Check out the acorns from my post the other day. I was pretty happy with my flat acorns but this is really fun! Are you going to try it? Drop me a comment and let me know . I would love to hear from you! And a big thanks to my friend and Fun Stampers Journey Coach Sara for sharing the coloring tip. 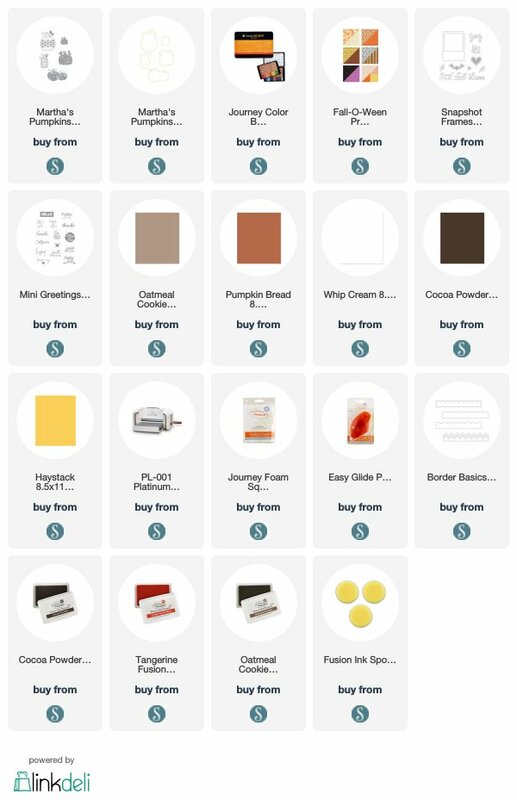 Here are the products used on the Fall Pumpkin card. Click the image to shop with me in my online.